Twice a month I get an email from photojojo that shows me a few pictures from my flickr from 1 year ago in a Photo Time Capsule. As things move so fast, and, at least for me, time to reflect and revisit past events seems to be missing from my regular routine. This is why I like getting these emails so much. I can take a peek at a year ago, revisit some memories and generally brighten my day. 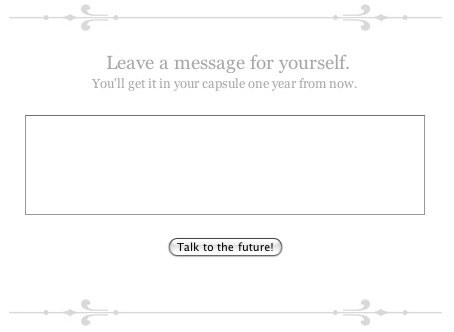 At the bottom of the mail is a great little form to send yourself a message in the future that will be delivered with your photojojo mail a year from now. A message to oneself feels a lot different than a photo that was meant for both myself and others, but I am interested in reading what I said a year from now.